Prepare to be inspired! 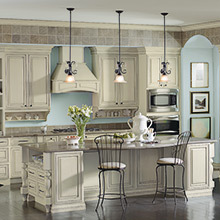 Our galleries showcase the many diverse looks you can achieve with Diamond cabinetry. Your imagination will be sparked by our beautiful imagery so you can hone in on your personal style preference. Visualize the style that depicts how you want to live your life. Ornate, rich and decorative, the traditional style is reminiscent of a not-so-distant past. Traditional design styles use a variety of colors, elaborate motifs and a blend of materials to create an elegant and inviting look. In today’s hurry-up world, this design style maintains order and refinement to balance your life.